To me, granola has always included warm, toasty spices like cinnamon and nutmeg. Oats and those wintery spices were like one big warm hug of deliciousness. But I’ve heard rumblings of people not liking spices in their granola. That to me seemed crazy – but I wanted to give it a try. However, I felt the oats and nuts needed an extra push to keep things on the up and up. I didn’t want to end up with a bowl of boring breakfast. That nudge here is brown butter, the noisette-like fragrance that comes from cooking butter a little longer than normal. The butter goes from melted to foamy and then to a golden brown. It’s toasty and warm and turns into something extra special. Brown butter can quickly turn from golden and nutty into a black mess, so keep your eye on it and don’t turn your head for a second, especially when it gets to the foamy stage. But once the brown butter is off the heat, this recipe comes together quickly. You toss it with brown sugar and maple syrup with vanilla extract tagging along for the ride. Then that mixture gets mixed with whole oats, almonds and coconut along with a good pinch of kosher salt. You most certainly could add hazelnuts or pecans instead, but I had almonds on hand and they were a fine choice. 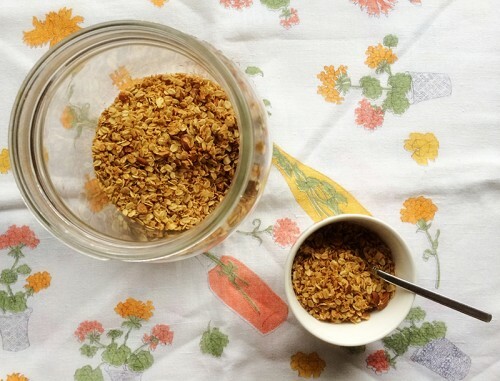 In this house, granola gets made in the evening just so that it can cool over night. It also makes breakfast in the morning super easy. I had a friend visiting me from Seattle and I wanted to make sure that I had at least something tasty for breakfast. We ate this with big dollops of plain Greek yogurt and spoonful of delicious local jam. Fresh local strawberries, or other fruit, would have been lovely too. Having a big jar of this granola, kept me in happy breakfast land all week long. Prep a walled baking tray with parchment paper. Preheat oven to 300F. In a small heavy-bottomed sauce pot, melt the butter over medium heat. Watch it carefully, as butter can burn quickly. When it starts to get foamy, let it cook a little longer until the butter turns brown, swirling it a bit to keep a close eye on it. Remove it from heat when the butter has browned and the scent is intoxicating. Stir in the brown sugar, maple syrup and vanilla and stir until well blended. Add the oats, almonds, coconut and salt into a large mixing bowl. Pour over the brown butter/sugar mixture and give everything a big stir with a wooden spoon. When everything seems well-coated, spread it evenly over the baking tray. 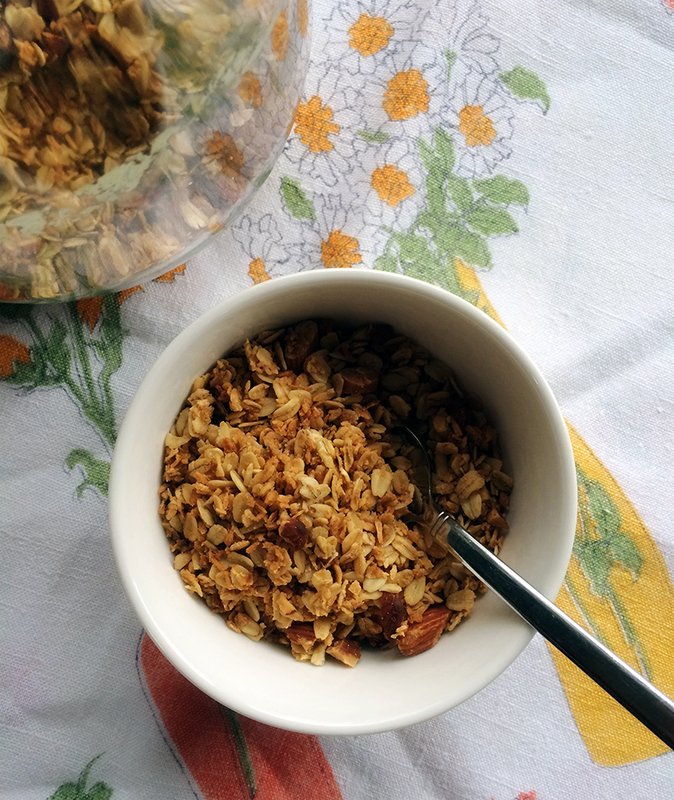 Bake for 45 minutes or until the granola is nice and golden brown, stir occasionally. Let cool and store in a large lidded container. Thanks Karen, spelling isn’t my forte. 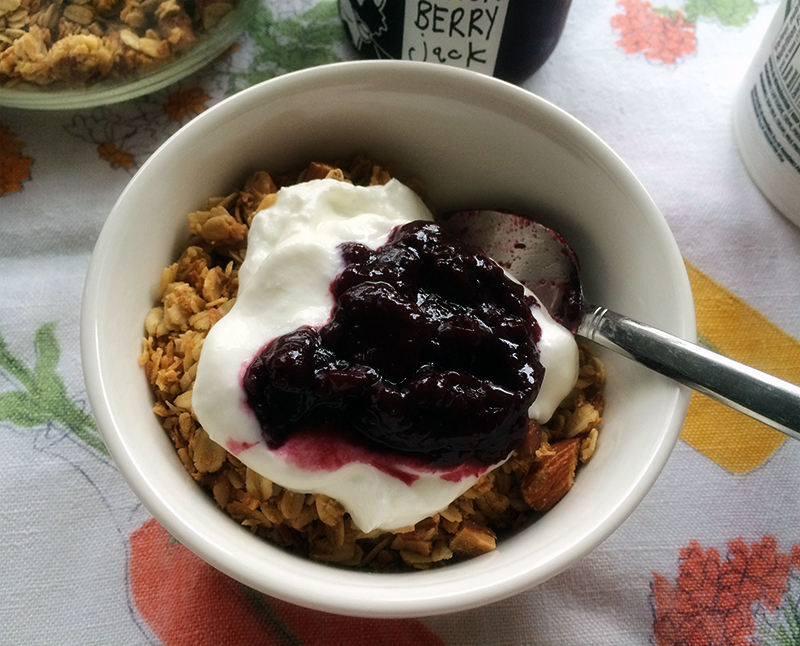 Love how you prepared this granola, such a great idea. This looks like all kinds of awesome!!! It must smell fantastic! Brown butter in foods is my weakness…YUM! Thanks Cheri, it’s a keeper! 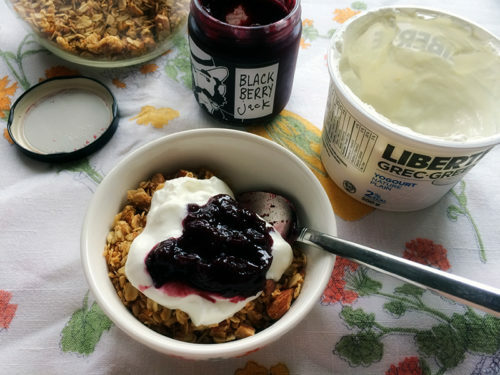 This granola looks incredible! I love browning butter – it is so transformative. What a great way to have brown butter for breakfast, too. mmmm.. the golden brown looks so inviting. What a great way to start the day! Thanks Lindsey! Brown butter is the best. Lucy, definitely a good way to start the day. So yummy dish. looking so tempting. 3/4 cup oats always every morn for me.. This idea I can definitely do!